Let’s start at the core of this grilled cheese and ask the obvious question: Is bruschetta a grilled cheese? 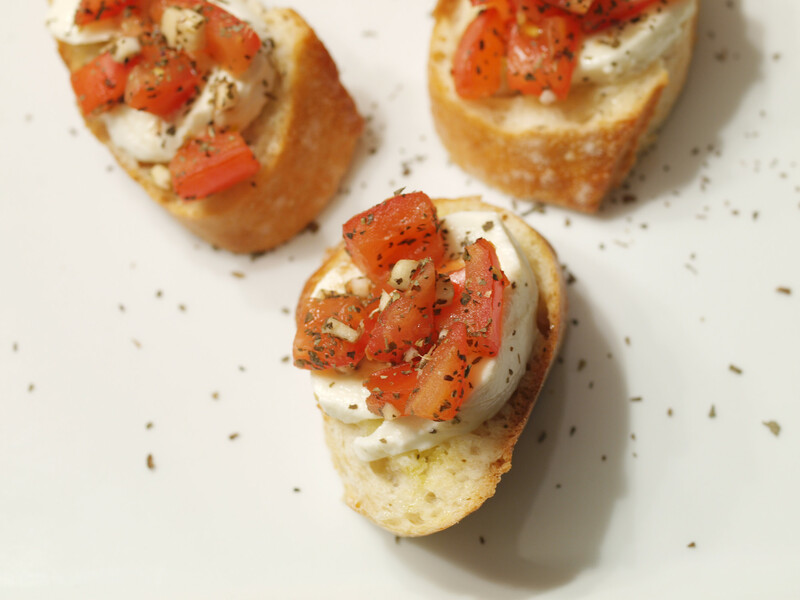 Traditional bruschetta does not typically include cheese and therefore, it would of course, not be considered a grilled cheese sandwich. However, variations do include cheese, such as the one I created. 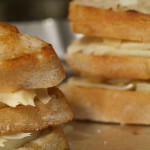 At the very basic, a grilled cheese includes cheese and bread, which bruschetta does as well. 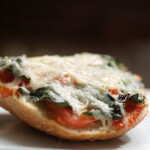 Therefore, I say if bruschetta includes cheese (and bread), among other ingredients, it can and should be considered a[n open faced] grilled cheese. Do you agree? Please let me know in the comments. This past weekend the folks and I were called into duty as babysitters/nanny’s as my sister and her husband headed to Chicago for a mini-vacation. From early Saturday until Sunday around dinner time, we watched and played with my two nephews. Once they left Sunday evening, I had the thought of trying to make bruschetta, especially since I had previously purchased the French bread. 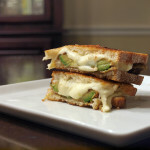 This worked out perfectly since everyone was too tired to make an elaborate grilled cheese. Plus, I had seen this exact Mozzarella at Whole Foods earlier in the day and just had to return to the store to purchase it. Our choices were between Ciliegine and Ovoline Mozzarella. While in the store, I was confused by the multiple types, but as far as I can tell now, the shape is the only true difference. Ciliegine Mozzarella is cherry shaped while ovoline is more egg sized. Since I wanted long slices, I went with the Ovoline. 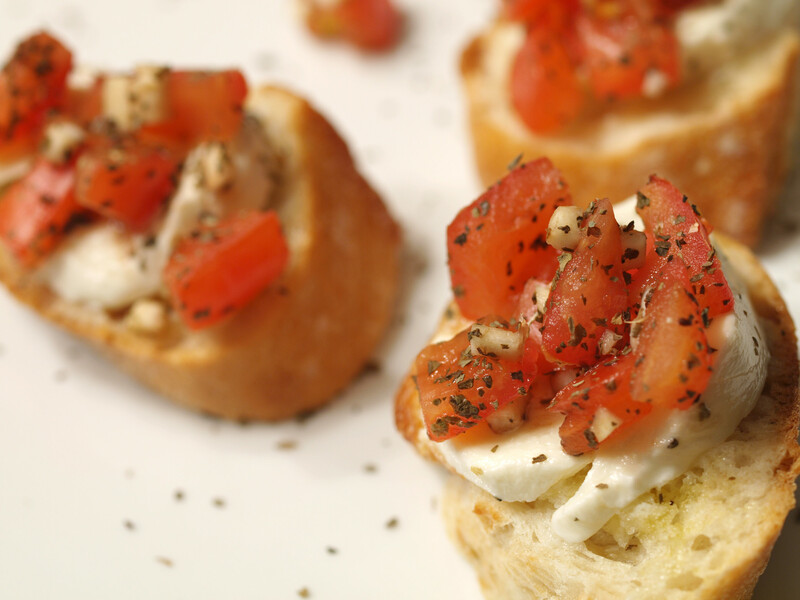 The fundamental ingredient of bruschetta is of course the tomato. Thankfully, we had a fresh tomato sitting at home, waiting to be chopped. Yum! We only had a drop of balsamic vinegar in the house, so I went on a scavenger hunt for at Whole Foods. I decided on this organic version, which turned out to be very good. 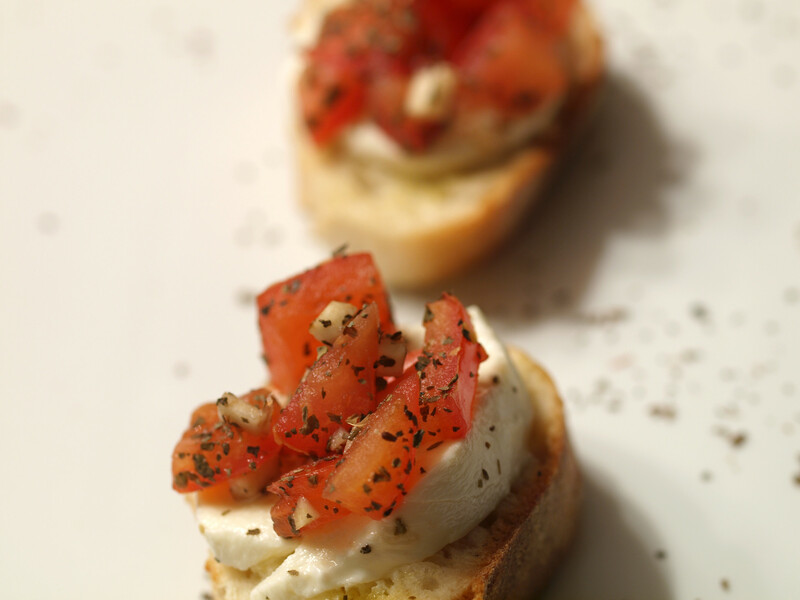 The best part of bruschetta is its simplicity. All I needed to do was add some chopped garlic, balsamic and basil to the already chopped tomatoes and mix. That is it. If you like other seasonings, I am sure you could add them as well. 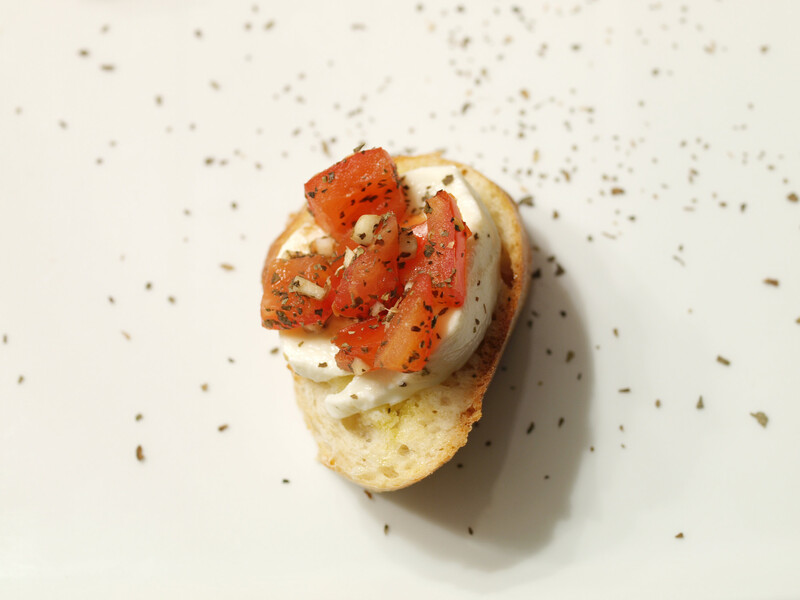 Bruschetta is open to personal interpretation. Have fun with it. I placed the fresh Mozzeralla and bruschetta mixture on top of slices of organic French baguette that were brushed with olive oil. If I did this again, I would have placed the bread in the oven for a few minutes to crisp prior to topping. I placed the final product in the oven for about 5 minutes to slightly melt the cheese. However, without the pre-crisping, the baguette was just a bit soft and mushy, but it still turned out fantastic. 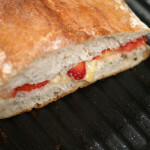 This bruschetta was the second best thing to creating a traditional grilled cheese and it took half the time. The balsamic mixed with the garlic, basil and tomatoes created an awesome flavor with the Mozzarella adding a great, fresh flavor. 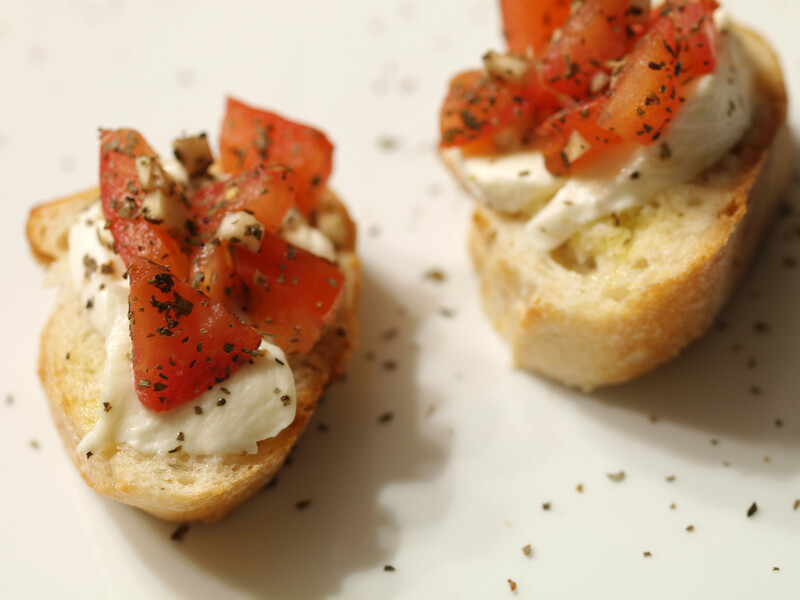 Bruschetta would be a great appetizer for any Italian meal, or as a snack, as was in this case. Plus, the simplicity makes this recipe approachable by just about anyone. 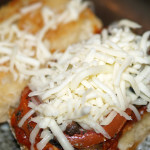 Posted in Grilled Cheese and tagged A Minus, baked, balsamic vinegar, french baguette, garlic, mozzarella, tomatoes. @ sippitysup Haha. I need to try burrata again as I don’t think what I tried at the Invitational was a fair first impression. It just seemed kinda blah and that doesn’t seem right. And we can definitely still be friends, just two awesome dudes with two awesome blogs.